Vaughn Davis Bornet’s Ph.D. is from Stanford University (1951), the B.A. and M.A. (1939, 1940) are from Emory University, the year 1941 was at University of Georgia. Author of over a dozen books and scores of articles and essays, he has been writing articles frequently in recent years on the internet’s History News Network. He holds “Distinguished” awards from American Heart Association and Freedoms Foundation. He taught at University of Miami, 1946-48, and Southern Oregon College, 1963-80. He was a staff member at The RAND Corporation in the 1960s. A Commander in the Naval Reserves, his active duty was 1941 to 1946. His 2016 books Lovers in Wartime, 1944 to 1945and another, Happy Travel Diaries, 1925 to 1933 (both Amazon) are recent. His latest is Seeking New Knowledge: A Research Historian’s Rewarding Career (Bornet Books). He lives, apparently only semi-retired, in Ashland, Oregon. There’s an awful lot to quote in this book. The author is clearly a talented African-American woman and we are always aware of it. She is seldom relaxed, it seems; on the other hand, despite mood swings, she is capable of great joy now and then. We are reminded that two of her family members were shot dead early on; and she worries—and has cause, as mobs misbehave here and there in her pages – but not quite cover to cover. Subtitle, “An Insider’s Account of the Trump White House,” but she is all over the place on content as we turn the pages: California, Ohio, Florida, NYC, downtown D. C.
The start is dramatic: she’s abruptly FIRED, and not the way we might be. For Omarosa, it was off to the Situation Room with that Kelly soldier where there were threats, loudness, recrimination, replies, locked doors, hints of violence. After that beginning, we have no doubt that this experienced lady is important and her memory feared. My book is marked up with big circles and “quote,” check marks, and “discuss.” This is a somewhat dramatic narrative, one to be taken seriously. One wishes the writer well, but there seems an aura of strain throughout, I thought. Is his mind sharp and clear? She is sure about his mental deterioration and writes clearly about both that and “his racism.” (Pages 292-93) At one point, this reviewer came to think: NO. Don’t be quoting this to our public! He’s the President of the United States. Limit those quotations. We never forget this book is by a black woman. It’s clear: “… white men who surrounded me….” “A white participant is given the benefit of the doubt; a black woman in the workplace never is, regardless of the circumstances.” (Page 265) This book is about something called “the cult of Trumpworld.” One word. On the other hand, Donald has been for years, after being handed immense startup money, unquestionably an entrepreneur, creator of useful hotels and golf courses, and a jovial entertainer of huge audiences. If I enjoyed all or any of those “Miss Bosom” programs he provided on TV, I really should thank him. 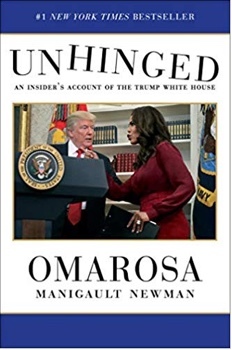 Still and all, I’m frightened by what I read in this book about DJT’s CASUAL, UNINFORMED, and IGNORANT “presidency.” Omarosa’s book , sure didn’t help my sense of well-being. As I read along, I felt, well, awful.Examples of an unfit, almost uncaring, certainly inadequate, President kept showing up, over and over. I didn’t like the really staggering contrast with earlier subjects of my books – Herbert Hoover, FDR and LBJ – surrounded as they were in office by brilliant, dedicated public servants who seldom resigned, listened obediently and unfailingly to briefings with consequences,, and spoke rationally and regularly to the man who chose them. Yes, they campaigned while in office, more or less, but they G O V E R N E D and mostly set aside their earlier occupations while in our employ. She handles much work with one hand behind her. Her favorite activity, it seems, is striving to change the political mindset of a giant mass of black voters out there, changing it to firm support of her current politician whoever it is, and doing that, whatever the cost or time-demand. One never-ending goal has been to advance her own personal popularity and reputation because it will surely help Donald J. Trump! Maintaining or enlarging his probable vote-count in the coming election was, for a time, her hope. Our book author casually mentions those 4,000 White House jobs to be filled way back when. It’s scary. Members of the staff were to “back up whatever the President said or tweeted, regardless of its accuracy.” (Page 211) What level of employee would allow that? On page 228 she almost casually speaks of “paranoia” setting in. Wow. Later, she wonders as to a tweet, “Does he even realize he sent it?” Italics hers. It all made me think of President Andrew Johnson’s turbulent administration, back when the Senate failed to convict by only one vote, despite impeachment by the House. Maybe I’ll read up on all that—to Be Prepared! This time, maybe seriously consider finishing what we start!